The Project of #baixem is based on a multidisciplinary diagnostic and participated of the study area, on the basis of which raised micro-interventions common criteria related to preservation of the natural environment and recognition of social needs that are related to two main performance areas. On the basis of the diagnosis and in accordance with values based on the preservation of nature and the promotion of social networks of associations have been established performance criteria grouped into four sections: environment, uses and facilities, social management and mobility. It proposes to develop micro-activities based on self-management and self-construction. The main goals of the project it is the purpose to show the politicians that city can be designed by the participation and collaboration through new working modes, generating sustainable and viable technics solutions for the project. 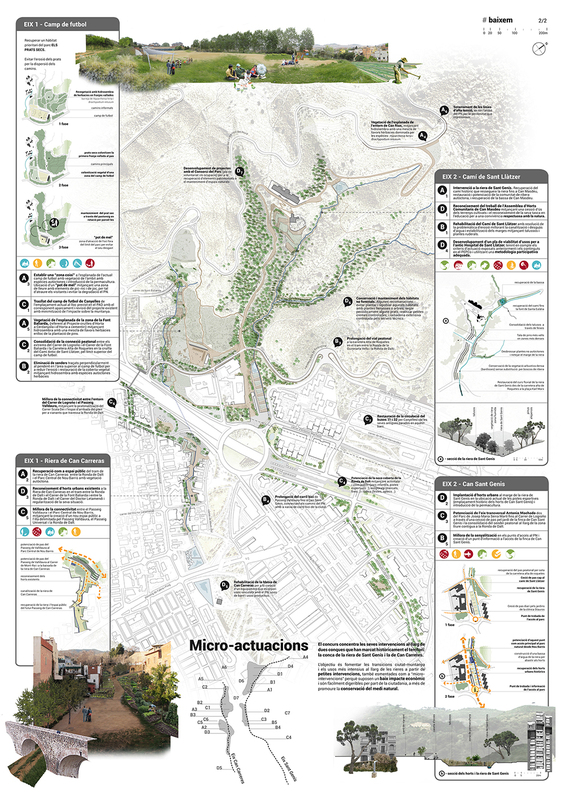 The project is developed for the Can Masdeu Valley in the Natural Parq of Collserola Mountain. Districts of Canyelles, Horta, Can Peguera i Guineueta. City of Barcelona. Spain. • Real participation: open workshops where the voice of the residents is listened. 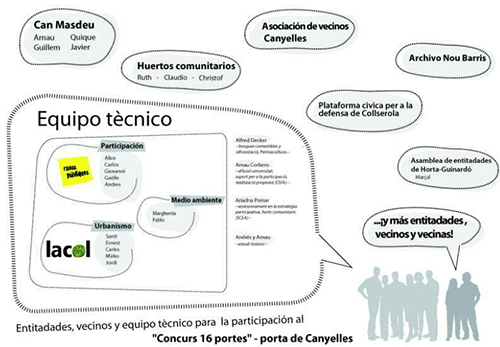 We have already started, and after meetings held in Can Masdeu and the Association of neighbors of Canyelles, will make the first participative workshop on 3rd December at the Ateneo Popular de Nou Barris. -> The popular enjoyment of the Mountain through its use of leisure. -> The recovery of primary activities (horticulture, forestry, beekeeping. . . ) in areas where traditionally had been developed and it is possible to regenerate them. Placing so close to a city densely populated, make possible the multifunctional use of space means to avoid uncontrolled massive use of valleys, forests, the streams, orchards. . . Away to get it is to place intrinsically more intense applications in areas where there is lessnatural value to preserve or already integrated in the urban setting (urban, solar parks indisuse…). At the same time, we have to preserve and back the gardening, the management of the forest and the signals of roads and placement of the leisure areas. • Public Infrastructure for the neighborhood: the public infrastructure must be in the city, close to the people, not on the top of the Mountain. Neighbors have always insisted that the infrastructure must place as closer as possible to the nerve centers of the districts to facilitate the access and the dynamic impact of the socio-cultural field. It will only make sense locate infrastructure in existing buildings, and only for purposes consistent with the condition of Natural Park in the sierra. ->prioritizing access of neighborhood proximity. • Neighbourhood management: should exceed approaches most pharaonic and constructive, giving priority to small interventions and alternatives of popular management, realistically with the crisis situation. We believe that in the Nou Barri any plane must be with the historical experience of the district, known as much for community management of publicfacilities such as access and use respectful of the sierra by the neighbors. 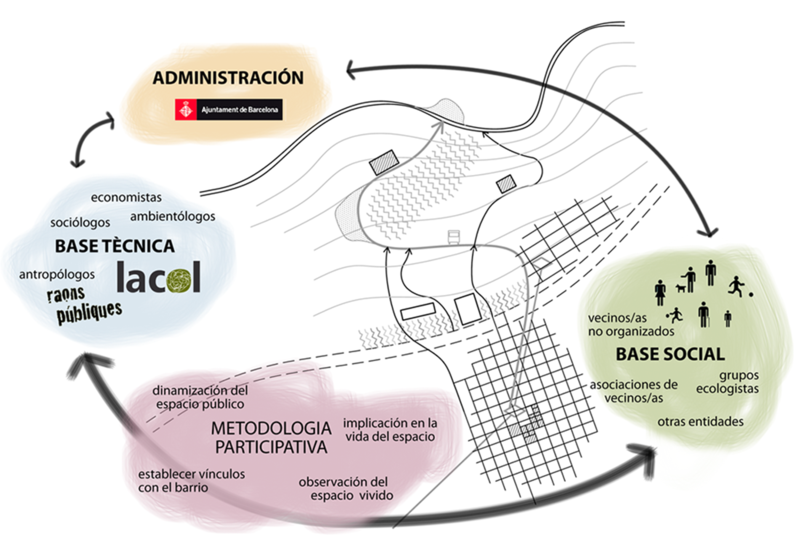 In this sense, may be inspiring examples of agro-ecological self-management of the Vall of Can Masdeu or the neighbourhood management of Font of Santa Eulalia, public areas, free of charge for administrations and where becomes reality the multifunctional vocation of the sierra, for the benefit of the common good. • Burying the high and medium voltage lines: these lines cause forest fires and pass very close to some houses, so that they affect the level of electromagnetism to its inhabitants. 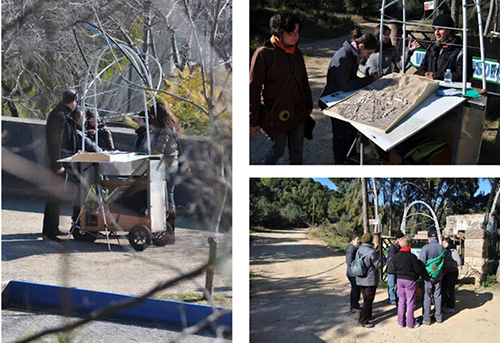 Citizens of the city of Barcelona, and specially inhabitants of the districts involve in the competition; Users of the Natural Park of the Collserola Mountain. 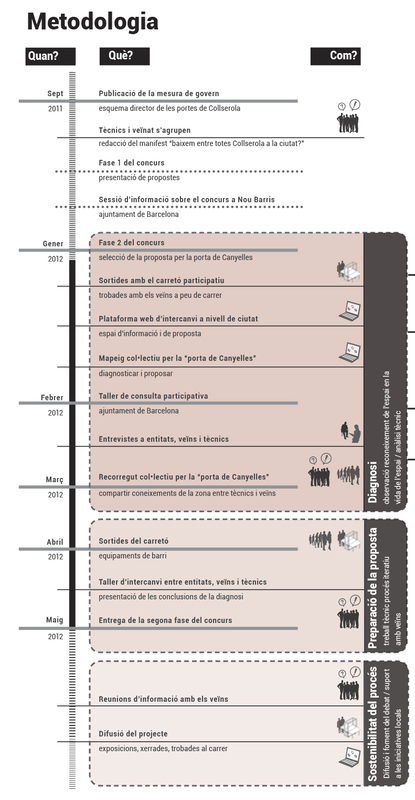 The year 2011 is a year of change in which the municipal government happens to be Convergència i Unió (Catalan right), but with a fragile majority, after more than 30 years of Socialist Government. This same Socialist Government had been working to transform the city, and in particular to give shape to the well-known “open the city to the sea”, promoted as a result of the investments generated by the organisation of the Olympic Games in 1992. This context of change of Government, the appointment of a new Chief Architect of the city, wanting to generate projects star in the city, in addition to which leads to the launch of the contest of the 16 doors of Collserola, whose goal is to “open the city to the mountain”. The contest raises 16 areas of intervention located in this urban fringe, in which 112 multidisciplinary teams (architects and urban planners associated with specialists from other fields) are called to work in order to produce proposals for management of these areas of transition between the urban and natural space. The competition is announced without consultation or prior information to authorities and residents of the territory, even the channels of participation of the city (such as neighborhood councils), generating mistrust of input with Forms. Likewise “participatory process” that arose included the simple collection of opinions in a single session in municipal spaces and the possibility that the residents can vote the proposals for the second phase. This vote was not binding and was done on panels presenting teams without any material facilitator or explanation that could help your understanding. Raons Públiques is an collective formed by an interdisciplinary group of professionals in the sector and different geographical origins, such as social workers, planners, antropòlogues, designers and architects. The team, formed at the end of the year 2009, aims to improve the processing and the management of the city through the awareness and the direct inclusion of their citizens in the decision-making process. Raons Públiques investigates through practice on new methodologies of intervention in public space that encourage civic responsibility. We believe that the way of transforming the city is through the active participation of the people who inhabit it and purposeful action. We work on the interests related to the quality of life of all people who share the city. The contribution of the architect is made within the urban movement, as one more piece of this gear, helping to translate concerns citizens andp utting them on paper; providing criteria for the definition of objectives and strategies as well as tools to define and communicate ideas through graphic drawing. . .society, acting fairly and solidarity andstarting with a system of horizontal work. We encourage debate and discussion about the uses of space and the management of urbanspaces, city models, the participation and the recovery of heritage. Citizens from the District, Inhabitants of the Masía de Can Masdeu, Neighborhood Association Canyelles, Coordinadora d’Entitats de Nou Barris, Arxiu de Nou Barris, Miquel Tormos, Carme Fiol, Francesc Llimona, Juli del Col·lectiu Agudells. • The creation/activation of a group of actors involved in the development of the project. The commitment of the project is to create a group of actors involved both in the diagnosis phase and the phase of definition of the proposal, where agents of the affected districts and technical equipment for continuous dialogue and collaborate in the various phases and activities of an iterative process. The “technical equipment” consists of professionals from different disciplines, linked or not with the districts of intervention, seeking to shape and technical feasibility to the needs of the intervention territory. The agents of the neighborhood called to collaborate in the process there are several: historical archive of district, associations of neighbors, environmental associations, collective squatters or residents and neighbors of the area found in the public space along the organised activities. • The definition of a design based on multi-step process. It consists first of all in a previous phase of diagnosis, the most important in this case because the low level of social diagnosis, produced by the city prior to the launch of the contest. At this stage the work consists of crossing the results obtained through the use of various qualitative tools. Secondly, the results of this diagnosis are reflected in a first draft of the proposal, which is worked and corrected in a workshop with a group of neighbors. Finally, the follow-up phase corresponds to the phase after the delivery of the proposal, and is mainly based on the need to maintain bridges of constructive dialogue and transparency between technicians, neighbors and administration, giving continuity to the project. • The use of participatory diagnosis and design tools. Employed tools seek to approach neighbors and neighbors not associated and generate dialogue and debate between the various actors involved in the intervention districts, it’s: outputs in the public space with a “participatory cart” in order to reach people who are not usually involved in the traditional process of citizen participation, interviews with key actors in affected neighborhoods urban journey inviting both neighbors and technicians to discover and share their knowledge of the territory, collective mapping accessible online from the website of the platform. Likewise, the result of the process’s main objective rediscover the social utility of urban project, reflecting on it the result of an analysis of neighborhood where they exit issues of consensus, conflict and spaces, areas with priority intervention, areas of potential for the improvement of neighborhoods generated through a direct and inclusive relationship with stakeholders in the affected neighborhoods, etc. The project #baixem has a strong social component. 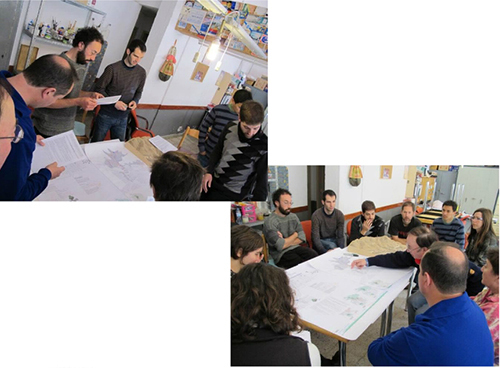 Participation citizen has been the most important tool to develop it into an architectural and design project for one of the entries of Collserola. The neighbors have been involved in the decisions, in the proposals and the discussions of the final results. To consider the green area of the mountain as a reserved public space makes to get down the infrastructures. New infrastructures for the citizens will place in the down-part of the mountain in-between the buildings of the district. The idea of the competition to develop public infrastructures in the top of the mountain was not a sustainable solution for the team of the project. Citizens used the mountain as a big green space to do free sports, spend the free-day doing a picnic or do hillwalking. In the goals of the competition was to develop a network of public spaces in the mountain, filling the areas, attracting people from outside of the neighborhood. The project #baixem takes these items as a disadvantage and for that they planned a design of the mountain for the needs of the district around. To reuse the old buildings and fabrics to use for new infrastructures makes the project sense, reducing the amount of money for the real needs of the citizens and eliminate the unnecessary spending in macro-projects. The winners of ’16 puertas de Collserola’ have been exhibited in the last Venice Biennale of Architecture. Anyway, the sixteen projects which were designed for the Collserola Mountain, have been kept in the City Hall and they are not going to be built because of economic problems. The opposition parties in the city voted against the projects because the high budget. Citizens feel upset and frustrated with the projects because some of them took part in the designs of the different teams for the competition. For the technical level, the work of months for architects, urban planners and designers have been used for a false advertisement of the city in an international level, but their projects are not going to be reals. Actions like this create distrust in the citizens and professionals to design the city of Barcelona. The social and economic situation makes us to think more about the design in the city. Professionals and citizens should work together to decide the main goals of urban interventions, from the urban scale to detailed one. The project #baixem, against the competition published by the council of Barcelona, propose the real needs of the citizens of the district thanks to a group of architects, urban planners, designers and other professionals, who understand the participative citizen as a design tool. Nowadays, some professionals have the sense of this strategy to work in a project for the city, but politicians have still the wrong idea of personalizing a project with a famous star-architect, or make their own ideas real without the participation of different agents in a city. Together with this, society is not used to be active in the participation of the decisions in a city. Maybe this fact is generated because of the old policy strategies. The European Union considers the Participation Citizen as a tool for the new urban decisions through the European Awareness Scenario Workshop with the gather of the actors and agents of a city. In Spain, new generation of professionals is getting closer to this ‘way of working’. Step by step, it will be more common and society will demand their participation and decisions in the strategies for a city.